We once again sincerely thank you for helping us facilitate our objectives and further our mission. The Farley Foundation has succeeded only because of your generosity, whether in the form of a donation of time or money, or by adopting one of our animals. Still, our costs continue to increase and your financial help is critical to our future. On average, and accounting for all of our expenses, each rescued dog costs The Farley Foundation nearly $500 to complete the process we insist upon following. Our adoption fees only cover about 50% of those costs. The difference is covered by private donations. We have accomplished quite a bit in a little over three years and will be able to do more only with your support. Thanks to you, 300 animals will be enjoying the holidays with their families in forever homes. Please help us continue our efforts to positively impact the serious animal overpopulation crisis here in North Carolina. The Farley Foundation’s objectives include promoting “no-kill” advocacy; preventing animal cruelty; encouraging animal welfare volunteerism; supporting spay, neuter and pet identification programs; and working with other local animal welfare organizations in achieving similar goals. As the remaining days of 2017 slip by and the holidays draw ever near, please remember The Farley Foundation in your year-end charitable giving. To make a donation, Click Here or simply mail your check payable to: The Farley Foundation, P.O. Box 606, West End, NC 27376. We created The Farley Foundation in early 2014 initially as a potential forum for animal welfare advocacy, pet responsibility and education. Changing circumstances took us in a different direction. In the Fall of 2014 we began facilitating the rescue, transport, and adoption of kittens with a northern rescue group. Soon thereafter, Debbie Adoree and Jimmy Dickenson, owners of Seven Lakes Kennels, generously donated the use of an area adjacent to their business containing 20 large kennels. After making several improvements to the existing space, we immediately began rescuing at risk dogs from county kill facilities. As of this writing, we have saved the lives of 300 animals, most originating here in Moore County. We believe that most of these animals would have been unnecessarily destroyed if they were not rescued… and without your support and generosity, this would not have been possible. Still, thousands of adoptable animals are unnecessarily killed each year in North Carolina public facilities but we will continue our efforts with your ongoing support. Many otherwise adoptable dogs are killed in public facilities solely because they have special needs, whether reversible unwelcome behavioral issues or treatable medical conditions. Although we prefer to rescue adoptable animals with no such issues (simply because they are more likely to be quickly adopted, thereby opening space for us to rescue another) we sometimes encounter special dogs that require more care and attention. They are more at-risk and as a result, we feel compelled to take them into The Farley Foundation. Abbey rests up at the Ficarro home. Abbey, a sweet two year old Aussie/Collie mix, suffered from a shattered elbow, the result of an untreated gunshot wound. During her first two weeks in residence, we kept her on pain medication and a very healthy diet, building up her strength and endurance for surgery. Requiring a quiet post-surgical environment, she bunked at the Ficarro house for awhile. It wasn’t long before Abbey rejoined the Farley pack for walks through Rassie Wicker Park in Pinehurst…and ultimately took up the lead! After she fully recovered from her amputation, her spay surgery was completed! She is now fully equipped with a specially designed Web Master harness by Tripawds and is ready to settle into her forever home. 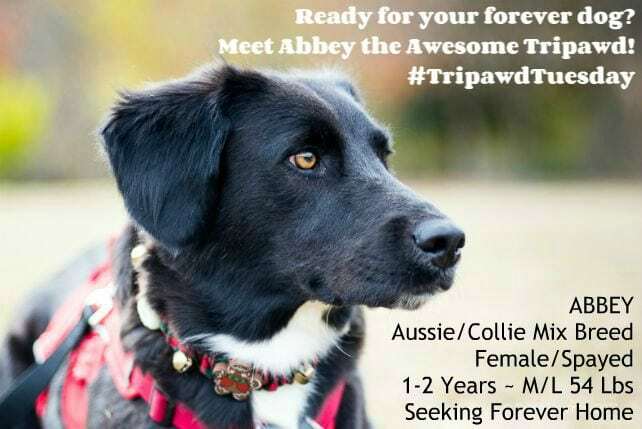 To read more about Abbey, recently featured in Tripawds Tuesday, please click here. To follow Abbey’s progress and learn more about her Click Here. Lazarus is a two year old St. Bernard/pitbull mix who has been substantially blind in both eyes since birth and was diagnosed with kidney disease after arriving at The Farley Foundation. His treatments include weekly sub-cutaneous fluid intake (administered by Betsy Ficarro and Volunteer/Vet Tech Kristen Seawell) plus a special diet (prepared by Chef John Ficarro). Despite these health issues, Lazarus remains a happy and good natured fellow! He is always patient and well behaved during his medical treatments. Laz is the official greeter as Volunteers enter the kennel. He loves car rides, and is ready to don his cowl necked sweater (below) to go for an early morning walk! To learn more about Lazarus and follow his progress Click Here. We would not have been able to save Abbey or Lazarus (and many other wonderful companion animals afflicted with medical conditions) without your help. Please remember that there are many more dogs with treatable behavioral or health issues that require too much time and money for a public facility to reasonably absorb. For the second time in 2017, Talbots hosted a Fashionable Fundraiser to benefit The Farley Foundation. On Thursday, November 9th, ten percent of all pre-tax sales were donated. We are grateful for the support of Talbot employees and for their concern for the welfare of Moore County animals. We are also grateful to the many shoppers who came out to support this event! Fashionista/Volunteer Lex Mitchell, representing The Farley Foundation, was on hand to assist store customers with their shopping, serving as a personal fashion consultant. The first annual Witches Night Out benefiting The Farley Foundation and hosted by our Founders (above) was held at Forest Creek Golf Club on Saturday, October 28th. From 7:00 PM until the witching hour, witches dined, drank potions (alcoholic, of course), danced, and cast spells to ensure the winning bid on Silent Auction items. Witches danced the night away, lead by our Supreme Witch and event mastermind, Betsy Ficarro. Entertainment was provided by Carolina DanceWorks and featured dancers Michael Hasson and Jacey Warren. The most frequently heard comments from the witches attending the event: “This was so much fun! Can’t wait until next year! I’m bringing all of my friends!” Many thanks to all of the local businesses who made donations to our Silent Auction and Raffle and helped make the event a huge success. Read what The Pilot had so say about Witches Night Out! The Seven Lakes Prescription Shoppe was a drop off location for Toys for Tots. On Friday afternoon, December 15th, Abbey, Champ and Lazarus helped make the delivery of toys donated by Farley volunteers… the sheer abundance of which caused the donation box to overflow! We are blessed with support from many in our business community, as well as a number of individual donors, and of course, our dedicated volunteers. Our principal business partner is Seven Lakes Kennels. Many in the local veterinary community provide The Farley Foundation with favorable rates on services and supplies. We are grateful for their support and demonstration of professional responsibility, in particular: Dr. David Garza of PineHills Veterinary Hospital in West End; Drs. James Watson and Laura Whitehead of Pinetree Animal Hospital in Aberdeen; and Dr. Tim Boyte of Carthage Animal Hospital in Carthage. Local retailers and other businesses such as: Cared For Canine and Cat, Loyel Media, PetSmart, Talbots, Bonefish Restaurant, Seven Lakes Prescription Shoppe, Paul Harkness Fine Jewelry, Molamphy and Associates-Nationwide, Aberdeen Exterminating, Forest Creek Golf Club and Pinehurst Laser Institute…among many others also support The Farley Foundation in a variety of ways, and we thank them all. Our outdoor space was further enhanced this year with the addition of agility equipment, designed and built by Troye Curtin, a 14 year old Pinecrest freshman and member of Boy Scout Troop 223. When Troye’s grandmother adopted a Farley dog named Lacy, Troye selected The Farley Foundation as beneficiary of his Eagle Scout project. In the aggregate, this project consumed over 300 man-hours of time. We know Farley dogs will be enjoying this equipment for at least that long. Betsy and John Ficarro (and Sweetie) thank Troye Curtin for his dedication in completing this project for the benefit of Farley dogs.